2ft³ for 10's seems large. I design pretty decent. I can get something done for you. I don't model with SketchUp or anything like that so you're going to have to live with just a cut sheet and dimensions. Have you checked the Thiele-Small parameters and recommended airspace from American Bass? 2.6ft3 @ 34.5hz for the pair is as big and low as I'd go after modeling it. 2.6ft3 @ 34.5hz for the pair is as small and low as I'd go after modeling it. Course' someone else could probably do better. Nice simple box too, I'd slap that together in a coulpa' hours or less. Looks damn good to me. 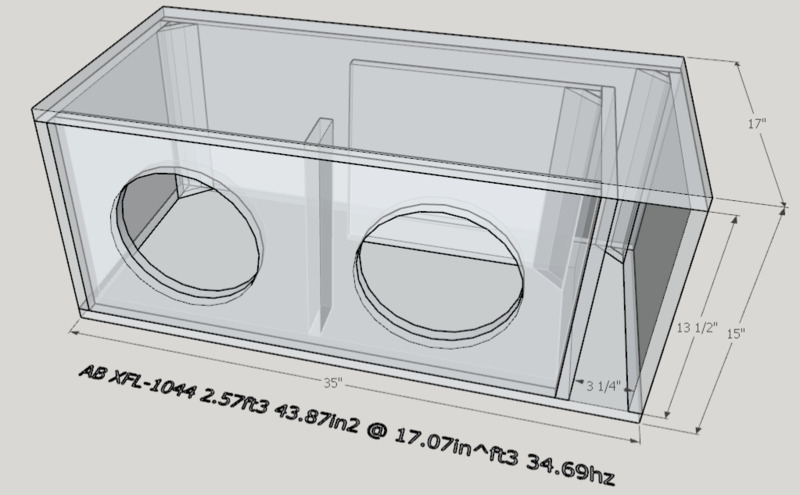 I would've designed very similar enclosure. Thumbs up for chiming in and being quick with the modeling.